Spray on. Drive. Rinse Away Debris. For years Drag Racers have used Geddex Burnout Guard to keep their quarter panels clean. Now Geddex offers the same protection for the front ends of ALL vehicles. 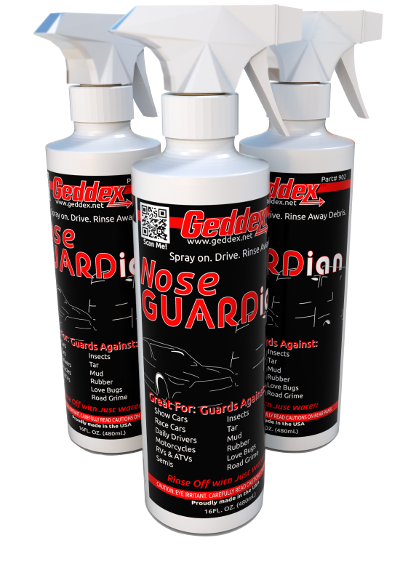 Formulated specifically for the nose of your vehicle, Geddex Nose GUARDian is a spray on barrier that makes insects, tar and road debris rinse off with just water. No more Scrubbing! Motorcycles, RVs & ATVs, Semis, Buses, and more!